Everybody should have a Vial of Life form filled out. The Vial of Life is a smart way to have your medical information on hand just in case of an emergency. Seniors need this because of their constant medical changes and medications … It’s the right thing to do. Put a completed form in your wallet, put a vial in your glove compartment, and especially on your refrigerator door – even put one in your child’s pocket. The Vial of Life is an Ebbetts Pass Fire District supported program that allows individuals to have their complete medical information ready in their home for emergency personnel to reference during an emergency. This program is used to provide the patient’s medical information when a patient is not able to speak or remember this information. Vial of Life programs are commonly used by Senior citizens and are promoted by senior center organizations, but this life saving program can be used by anyone in need. 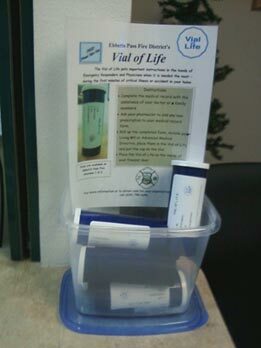 The blue Vial of Life vials are available free from Ebbetts Pass Fire District at Station #1, 1037 Blagen Road, Arnold. The program also has decals, medical information forms, and other materials are typically free, and some may be downloaded and/or printed for free from the internet. While there are number of different programs and agencies that provide these materials, the website VialofLife.com is the most prominent. Individuals can request free forms and UV coated decals on this website and can even save their information online through the secure online database. This allows patients to update and print their changing medical information. The VialofLife.com and VialOfLife.org websites are live security protected sites where individuals and organizations can fill out the Vial of Life medical information form and print or edit their data. May I speak to you from my heart ? People find themselves in emergencies that make it difficult to think straight. At these times, all emergency personnel who are trying to help you need to know many things about you – especially if you have a complex medical history. American Senior Safety Agency medical alert systems knows how important this information is and has graciously donated over 4 million decals nationwide. It is with their help that this program is able to continue. Who you are … what medications you are using … what illnesses you have … who is your emergency contact person … what is your normal blood pressure … are you wearing hearing or seeing devices … do you speak English … and, if not, what language do you speak ? Emergency personnel would love to know what your last EKG looked like. This gives them critical information on any current heart event you may be having. A good example of the value of a copy of your EKG is me. I have what is known as an inverted T wave. Don’t ask me what it means, I don’t know. For me this is normal and I’m fine. However, if I were not able to speak for myself and tell the medical personnel that I have a weird T wave … they would have great concern over nothing. They would most likely treat me, by lack of knowledge, incorrectly. When you get to the hospital … they want to know more. What insurance do you have, etc. These are very annoying questions when you don’t feel well, and sometimes you may not recall the answers because of your condition. The Vial of Life speaks for you when you can’t speak or don’t feel well. Protect yourself, and all of your family members … all it will cost you is a little time. And it could save your life!